You are buying Enfamil WND 2 Powder Non-GMO Metabolic Formula Vanilla 1lb Each, Model #4506788. ADW Diabetes offers a complete line of Enfamil baby formula products both in liquid and powder form. We offer these items in both single and discounted bulk quantities for your convenience.Shop with ADW Diabetes as we provide excellent customer service, low prices, and fast shipping! 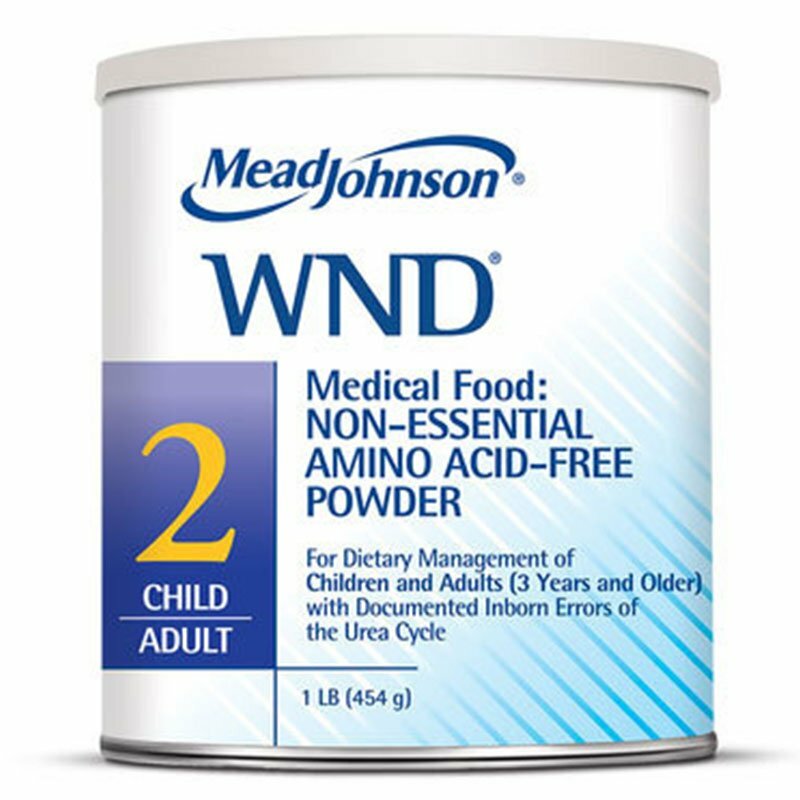 The Enfamil WND 2 Powder Non-GMO Metabolic Formula Vanilla 1lb is an iron-fortified medical food powder that is free of nonessential amino acids for children and adults with inborn errors of the urea cycle (waste nitrogen disorders). WND 2 medical food powder provides the essential amino acids as well as carbohydrates, fat, essential fatty acids, vitamins, and minerals. Provides essential amino acids; does not contain nonessential amino acids. 8.2 g protein equivalents/100 g powder. Vitamin and mineral levels appropriate for children and adults. WND 2 should only be used under the direct and continuing supervision of a doctor. Corn Syrup Solids, Amino Acids (L-Isoleucine, L-Valine, L-Threonine, L-Trosine, L-Phenylalanine, L-Histidine, L-Tryptophan, L-Methionine, L-Cystine), Sugar, Soy Oil, Modified Corn Starch, Calcium Phosphate, Potassium Citrate, Sodium Citrate, Magneisum Phosphate, Potassium Chloride, Sodium Phosphate and Less Than 1%: Choline Chloride, Ascorbic Acid, Taurine, Inositol, Ferrous Sulfate, L-Carnitine, Zinc Sulfate, Niacinamide, Vitamin E Acetate, Calcium Pantothenate, Maltodextrin, Cupric Sulfate, Manganese Sulfate, Vitamin A Palmitate, Thiamin Hydrochloride, Vitamin B6 Hydrochloride, Riboflavin, Folic Acid, Vitamin D3, Chromic Chloride, Sodium Molybdate, Sodium Iodide, Sodium Selenate, Biotin Vitamin K1, Vitamin B12, Ethyl Vanillin.